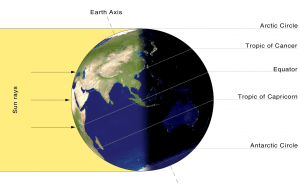 As the Earth rotates on its axis, the Sun shines on only one part of the Earth at a time. While the sun shines where you live, it’s nighttime somewhere else. When you’re eating your breakfast cereal, children in Paris are finishing the school day and children in Moscow are eating dinner. Children in Bangkok are going to bed and children in Sydney, Australia are getting up for the next day of school. It wouldn’t make sense for us to be on the same time. Instead, countries all over the world are divided into time zones, based loosely on longitudinal bands. Large countries, such as the U.S. and Russia, may be divided into three or more time zones, but most countries fall in one zone. 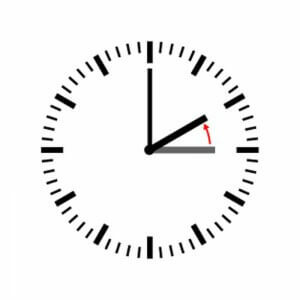 Many countries follow daylight saving time, which is designed to allow people to enjoy more waking hours during daylight. In most of the U.S., our clocks spring forward one hour in the spring. They fall back one hour in the fall. 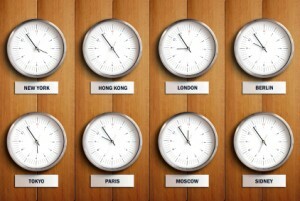 As you move around the globe, you’ll eventually reach a place where the time is either one day ahead or behind. This place is known as the International Dateline. Australia and a few other places are a day ahead of you. When it’s Monday where you live, it’s Tuesday there. Before you call a friend overseas, make sure you know what time it is there. Otherwise, you might call your friend at 3:00 in the morning. Who wants to talk then? A video explaining why time zones were established and how it came to be. Question: How do you adjust the time when you cross into a different time zone? Answer: Cell phones and computers automatically adjust to a new time zone. You can move a watch forward or backward. Enjoyed the Earth Science for Kids all about the Time Zone info? Take the FREE & fun Time Zone quiz and download FREE Time Zone worksheet for kids. For lengthy info click here. Declan, Tobin. " Time Zone Facts for Kids ." Easy Science for Kids, Apr 2019. Web. 25 Apr 2019. < https://easyscienceforkids.com/all-about-the-time-zone/ >.